Shefali Patel-Shusterman (Westfield) - Book Appointment Online! 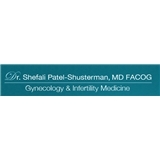 Welcome to the office of Shefali Patel-Shusterman, M.D., F.A.C.O.G. We appreciate that you have chosen us to take care of you. We are a boutique, gynecologic practice specializing in the full spectrum of women's health. We respect your time and never double book patients. We accommodate all of our patients who need to be seen, even on short notice. If anything is abnormal or follow-up testing needs to be done, Dr. Patel personally calls each patient to discuss treatment options. Dr Patel specializes in fibroid management, HPV management, endometriosis,and PCOS. If you have a problem which requires surgery, Dr. Patel offers the latest minimally invasive procedures including operative hysteroscopy / laparoscopy, laparoscopic hysterectomy, and hysteroscopic ablation/sterilization procedures. Dr. Patel performs her surgeries at either Overlook Hospital or Short Hills Surgery Center. The doctor was very thorough and educational. Had a great experiencd.